In the last five days, I had the chance to train three times with Nagato sensei and I noticed a new “trend” in his way of teaching. I have been training under him for over twenty years and I see when things are changing. As it is (should be?) the case for all of us, he is still evolving and he keeps improving his taijutsu. 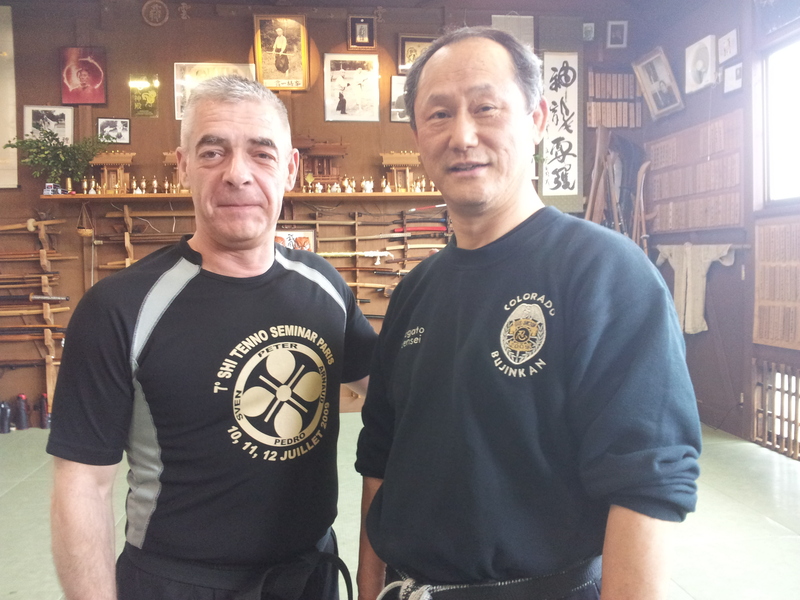 Each one of the Japanese shihan has developed his own taijutsu over the years. I remember telling Hatsumi sensei one day that when in Japan I had the feeling that I was training the bujinkan with him and the Oguri ryû, Noguchi ryû, Nagato ryû and Senô ryû. He answered that I was correct and that it is the way things should be. As a sidenote, I want to add that when you have the chance to be in Japan you should not limit your training only to sensei’s but take the opportunity to learn different ways to train by visiting as many shihan as possible. Our body movement is the melting pot of all these experiences and the more experiences you have the more likely you will find what is suiting your body. Yesterday for example I was training with my tall friend Robin. At some point I was totally unable to apply the technique on him as he is much taller than me and that in a ganseki like movement, I couldn’t lock his arm without holding it with mine. His arm kept popping out of my shoulder (angle). So I had to change the technique and do a regular ganseki to do it. Later on a hip lock technique Robin was unable to do it on me, I was too low. Each time he would try it, this would create openings for counter. I liked his comment at that time: “this one is not for me, I will never do that”. And this is the main point of training with different teachers. Everything they demonstrate and teach cannot be fitting us but be recognizing it we learn to avoid those movements detrimental to our survival. Another point is that apart from being students of Hatsumi sensei, each one of us is more or less the student of a given shihan. I mean that we received our taijutsu foundation from one particular shihan at the beginning. And from there we evolved by training with the others. It was obvious yesterday, Robin is a Nagato sensei student, I am a Noguchi student. And our taijutsu are quite different because of our different origins. From 1993 and until the opening of the honbu dôjô (10th heisei, 10th moon, 10th sun, 10th hour, 10th minute)* sensei ordered me to train exclusively with him and Noguchi sensei. After this opening I was allowed to train with the sole shi tennô and only when they were teaching at the honbu. I had been training with Nagato sensei before 1993 and I liked his taijutsu that was looking more powerful and more efficient. Gaman was permanent during his classes. I remember him stopping the class one day saying: “I don’t hear the hits!”… Next time you visit sensei in Japan, I invite you to ask him with whom you should train in particular. Depending on who you are and from where you are coming sensei will direct you to one or many shihan to help you unfold your own taijutsu. Over the years, like many of us, Nagato sensei pure power was replaced by a more softer approach of the fight and mental pain replaced body pain. He didin’t lose efficiency though. We can say the same with Hatsumi sensei too. But Nagato sensei’s style has always been focusing on “real fight”, real encounters. Even when his taijutsu became softer he was still having this nice powerful flow of movement, changing his hands permanently, crossing the arms and unfolding uke to take his balance and finally stab or hit him from a blind spot. 目潰し Metsubushi, blinding powder: In each technique Nagato sensei insists that we are using metsubushi to blind the opponent. This “metsubushi” action of the hand and finger can be real or not, the idea is that uke reacts to it. Whether you are throwing something at him or not doesn’t matter as log as your action opens up new holes in his guard. Remember that illusions can be powerful. 岩石投げ/落し Ganseki nage/otoshi: This “prayer” move will open uke, extends his arms and allow you to place a devastating ganseki like movement. Many techniques we did ended up in ganseki age or ganseki otoshi. This created more space to turn around and helped to guard ourselves from any short weapon attack. This was the kaname. Remember that kûkan is everything. 斜八脚 Sha ha ashi**, moving the legs in all directions: In many throws we often create a body reaction from uke resulting in a failure. By using the footwork and the sha ha ashi moves we unlock these tensions and become able to throw or crush uke. Remember that distance is given by footwork. 見えない技 Mienai waza, invisible technique: We also did some knife applications (weapon in the left hand) where we used it as a natural extension of the hand, always hidden from uke’s sight. Instead of grabbing the attacking hand we would simply place softly (Kochô gaeshi) the knife on the forearm, hidden under our other arm crossed over uke’s chest. Nagato sensei said that: “it is easy to use a knife in plain sight but not showing it is smarter”. This is the same with our fighting skills, don’t show them and you will keep an advantage over your opponents. If you look strong and powerful you are asking for troubles. *note: Numerology rules Japanese lives. The inauguration of the honbu dôjô took place on the auspicious day of the 10th october of 1997, at 10:10pm. The repetitive “10” can be seen as the completion of the cycle (kû); and also as the beginning of the bujinden, the transmission of the bujin to the world. **sha ha ashi is a concept explained in “togakure ryu taijutsu”, first tenchijin book published in 1983 by Hatsumi sensei. it is also in the 1987 edition reedited by Solkan. Sha diagonal, ha all directions and ashi leg. It is using the legs on the shin bone, heels, foot to apply lever on uke’s legs and take his balance. It is sometimes referred as “Ashi rau”. Hi Arnaud, thanks for sharing your useful thoughts. Well, not everyone is good for the same technique. This is the reason why Bujinkan in my opinion is the best Martial Arts with the most variety of movements. Keep going.